Legendary photographer and lifelong motorcyclist Eric Kitchen will be guest of honour at this year’s eighth Moidart Peninsula Road Run on Thursday, April 28. John McCrink, joint organiser of the run with Andrew Johnstone, said: “At a mere 84 years young, Eric is as fit, active and enthusiastic as ever and still enjoys covering events, particularly trials, which he’s been doing with great success since he bought his first 35mm Pentax camera way back in 1966. 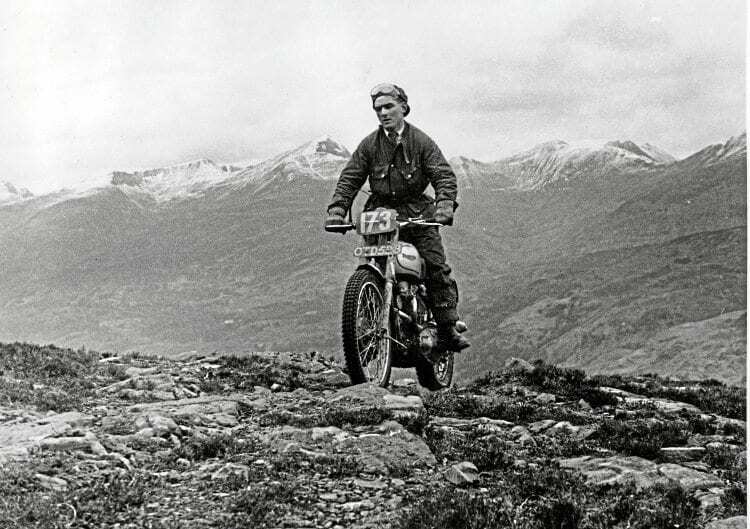 Despite riding his Triumph Trophy twin all the way from his home in Lancashire to the start of the Scottish Six Days’ Trial and back in 1953 and 1954, Eric scored two great finishes in the event, and is seen in action on the motorcycle he still owns. on 01620 248304 (email johnmccrink@googlemail.com) if you fancy a ride. Competitors and spectators alike are familiar with Eric’s photography, which has graced motorcycle publications for many years and included coverage of world and British championship rounds, many hundreds of club events, arena trials, the Scott, Scottish Six Days, Pre-65 and Beamish Trials – and no one was surprised to see him at some of the remotest parts of the Moidart Peninsula, snapping away as the 80 riders breezed by. He’s been doing the same ever since. 500T Norton, he won a first-class award in the 1953 Red Rose Trial, and on a Triumph twin in 1953 and 54 he had two excellent finishes in the Scottish Six Days Trial after riding the bike to the start in Edinburgh from his Lancashire home – a round trip of a mere 352 miles! Incidentally he still owns that very same Triumph Trophy. Eric will be flagging the riders on their way from the Moidart Peninsula Run’s traditional starting point, the Viaduct Car Park in Kinlochleven, at around 9.30am.